I guess I find it necessary to address my teenaged self. 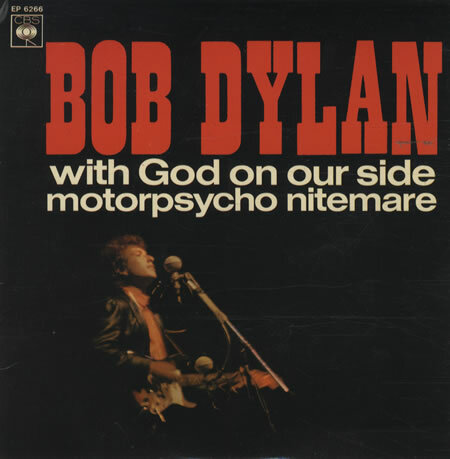 When I was sixteen or seventeen I thought “With God On Our Side” was one of the great Bob Dylan songs. Today? Not so much. Here’s why I don’t like it. It is sort of droningly repetitive. It is dull and predictable. It is musically inert and lifeless. It goes on way too long. There seems to be very little that can be done with it to improve it. It has one of the all-time worst Dylan rhymes (on the Holocaust, he says of six million dead “In the ovens they fried” – hey, there are only so many things that rhyme with “side” and he’d already used ‘pride’, ‘hide’ and ‘died’). I have to say that it’s semi-embarrassing that I ever touted this as a great anti-war anthem. Here’s why I did like it. It marched through the history of American war exploits as a lament, and in a mid-1980s Cold War atmosphere filled with fractionally talented punk rock lyricists, this seemed like poetry in comparison to more contemporary bands that I was listening to. The song has a profundity that probably seems most profound to the young. Here’s what I still like about it: the penultimate verse, about the betrayal of Christ. That’s still a good piece of writing for a pop song. Dylan did a great version of this at Town Hall, where he first performed it, but the most interesting version to my ear is the Carnegie Hall show in October 1963. During that rendition, the crowd applauds on a couple of occasions at the conclusion of verses, including the one about the Second World War and the fact that “we forgave the Germans, and then we were friends”. It’s a really telling moment for me, indicative of certain attitudes about that war among the young people of the 1960s that have been obscured over time. Listening to it now, I find versions are better or worse depending on what Dylan puts into it vocally. With its minimalist instrumentation, it’s a good showcase for his lamenting voice when he lets it be. Overall, a song that’s fallen a great deal in my estimation, but once upon a time it was a favourite.